FROM To Sri B.V.A. Krishna Murthy, All District Educational Officers, Director(FAC), In Andhra Pradesh A.P. National Green Corps Guntur. 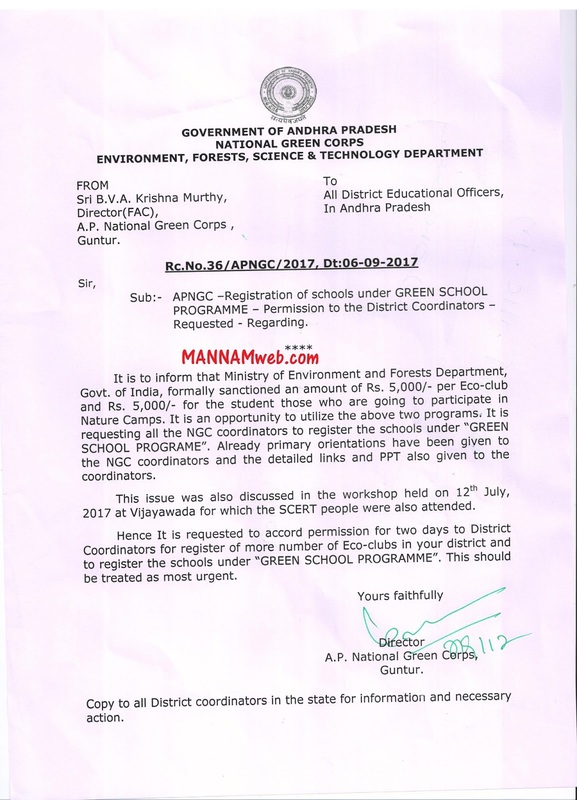 Sub:- APNGC -Registration of schools under GREEN SCHOOL PROGRAMME - Permission to the District Coordinators -Requested - Regarding. It is to inform that Ministry of Environment and Forests Department, Govt. of India, formally sanctioned an amount of Rs. 5,000/- per Eco-club and Rs. 5,000/- for the student those who are going to participate in Nature Camps. It is an opportunity to utilize the above two programs. It is requesting all the NGC coordinators to register the schools under "GREEN SCHOOL PROGRAME". Already primary orientations have been given to the NGC coordinators and the detailed links and PPT also given to the coordinators. This issue was also discussed in the workshop held on 12th July, 2017 at Vijayawada for which the SCERT people were also attended. Hence It is requested to accord permission for two days to District Coordinators for register of more number of Eco-clubs in your district and to register the schools under "GREEN SCHOOL PROGRAMME". This should be treated as most urgent.